Address are given below for Bharathi PU College Posts. 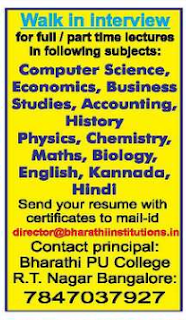 Eligible candidates can attend the wail-in interview for Bharathi PU College Lecturer Posts. For these jobs can apply as soon as possible early. Available vacancy, Salary, Important dates, Selection Process, Application Procedure, Qualification are given below. Starting Date to apply for Lecturer Jobs: as soon as possible early. As per the Post Requirements. Eligible candidates can send the Updated Resume with all Educational Certificates copies to College Email-id Address are given below.